AAA has her first child borne from a previous relationship, a boy named CCC. During the relationship with BBB, AAA bore two more children namely, DDD and EEE. BBB and AAA married in civil rights and thereafter, the birth certificates of the children, including CCC’s, was amended to change their civil status to legitimated by virtue of the said marriage. The relationship, both admit, was far from ideal and has had its share of happy moments and heated arguments. BBB alleges that AAA’s irrational jealousy has caused their frequent arguments. AAA, on the other hand, alleges that their heated arguments were often due to BBB’s incessant womanizing. The breaking point for AAA came when BBB’s alleged mistress, insulted and humiliated AAA in public, in the presence of BBB himself who did nothing to stop the same. Extremely hurt, AAA decided to leave the conjugal home with the children and lived temporarily at a friend’s house. While living separately from BBB, AAA discovered that BBB was not paying the rentals due on the condominium unit they were occupying, forcing AAA to move out. AAA was likewise compelled to find work to support the family, after BBB has started to be remiss in his financial obligations to the family. AAA likewise feels threatened after discovering [that BBB] was stalking her and/or their children. Citing the foregoing as constituting economic and psychological abuse, AAA filed an application for the issuance of a Temporary Protection Order with a request to make the same permanent after due hearing, before the Regional Trial Court. Finding good ground in AAA’s application, the RTC issued a Temporary Protection Order (TPO) which was thereafter, made permanent by virtue of a Decision of the RTC. BBB filed before the CA an appeal to challenge the RTC Decision. The CA affirmed the factual findings and dispositions of the RTC, but ordering the remand of the case for the latter to determine in the proper proceedings who shall be awarded custody of the children. Hence, this instant petition for review on certiorari. Pending the Court’s deliberation of the instant case, BBB filed a Manifestation and Motion to Render Judgment Based on a Memorandum of Agreement (MOA). BBB alleges that he and AAA had entered into a compromise anent the custody, exercise of parental authority over, and support of DDD and EEE. BBB claims that DDD and EEE are now under his sole care and custody, which allegedly renders moot the provision in the PPO relative to support. BBB points out that CCC is not his biological son. Impliedly then, BBB justifies why CCC is not entitled to receive support from him, being not his biological son. 1. Is the petition a proper subject of a compromise agreement? 2. Is CCC, AAA's child from previous relationship, not entitled to receive support from the petitioner, BBB? On the first issue, the instant petition is not a proper subject of a compromise agreement. The Court cannot take the simplest course of finally writing finis to the instant petition by rendering a judgment merely based on compromise as prayed for by BBB due to reasons discussed below. Alleging psychological violence and economic abuse, AAA anchored her application for the issuance of a TPO and a PPO on the basis of the provisions of R.A. No. 9262. In the instant petition, what is essentially being assailed is the PPO issued by the RTC and which was affirmed by the CA. The rules, however, intend that cases filed under the provisions of R.A. No. 9262 be not subjects of compromise agreements. It bears stressing that Section 23(d) of A.M. No. 04-10-11-SC (Re: Rule on Violence Against Women and Their Children) explicitly prohibits compromise on any act constituting the crime of violence against women. While AM No. 10-4-16-SC (Re: Rule on Court-Annexed Family Mediation and Code of Ethical Standards for Mediators) on the other hand, directs the referral to mediation of all issues under the Family Code and other laws in relation to support, custody, visitation, property relations and guardianship of minor children, excepting therefrom those covered by R.A. No. 9262. The Court notes BBB’s manifestation that he and AAA had arrived at an amicable settlement as regards the issues of custody, exercise of parental authority over, and support of DDD and EEE. While these matters can be lawful subjects of compromise, AAA’s vacillation compels the Court to exercise prudence by directing the RTC to resolve with finality the aforesaid issues. The parties are, however, not precluded from entering into a compromise as regards the aforesaid issues, but the Court now requires the RTC’s direct supervision lest the parties muddle the issues anew and fail to put an end to their bickering. On the second issue, CCC is entitled to receive support from the petitioner, BBB. 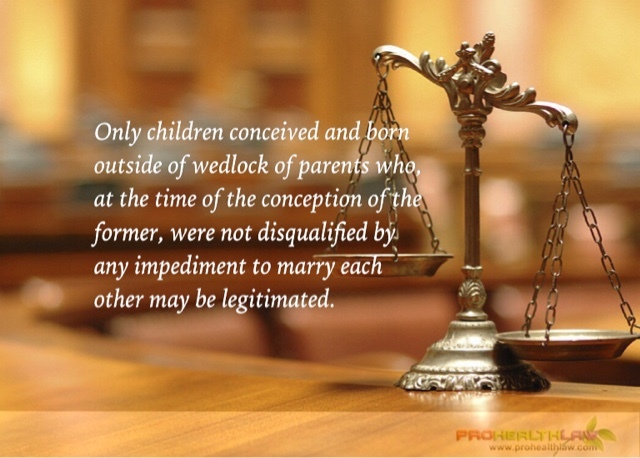 Article 177 of the Family Code provides that "only children conceived and born outside of wedlock of parents who, at the time of the conception of the former, were not disqualified by any impediment to marry each other may be legitimated." Article 178 states that "legitimation shall take place by a subsequent valid marriage between parents." Art. 1431. Through estoppel an admission or representation is rendered conclusive upon the person making it, and cannot be denied or disproved as against the person relying thereon. At least for the purpose of resolving the instant petition, the principle of estoppel finds application and it now bars BBB from making an assertion contrary to his previous representations. He should not be allowed to evade a responsibility arising from his own misrepresentations. He is bound by the effects of the legitimation process. CCC remains to be BBB’s son, and pursuant to Article 179 of the Family Code, the former is entitled to the same rights as those of a legitimate child, including the receipt of his father’s support. Notwithstanding the above, there is no absolute preclusion for BBB from raising before the proper court the issue of CCC’s status and filiation. However, BBB cannot do the same in the instant petition. BBB, Petitioner, vs. AAA, Respondent.